When your cat develops sniffles and itchy ears, several factors could be responsible for making your cat miserable. Allergies and nasal polyps are two possible culprits, or the problem could be a respiratory infection that is traveling back and forth from the nasal cavity into the eustachian tubes. In extreme cases, your tabby could be exhibiting symptoms of the deadly feline immunodeficiency virus (FIV). Check your cat’s ears to ensure they are not infested with mites or visibly red and sore. Look for black or orange dots that indicate an insect infestation inside the ears. Also look at her nose for signs of swellings or discharge. Do not attempt to treat any of your findings yourself or to insert anything into the animal’s ear canals or nostrils. Simply observe so you can share this information with your veterinarian. 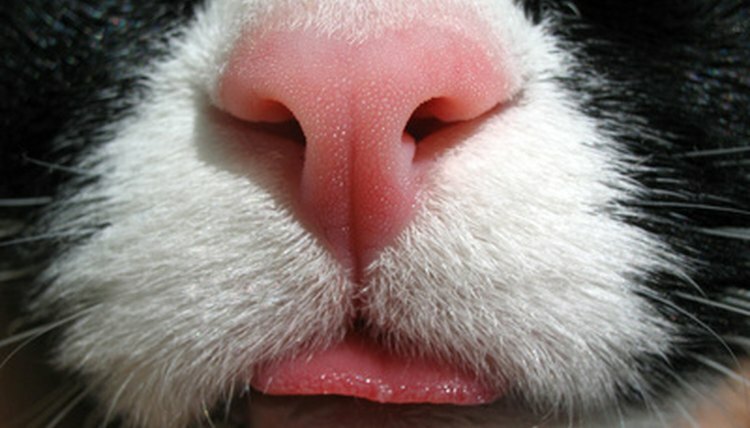 As with humans, felines catch upper-respiratory infections that swirl through the sinuses and ear tubes. An old-fashioned cold is not serious, but you need to monitor your cat’s symptoms to ensure they don’t worsen. Allergies cover a broad spectrum of problems, and symptoms of any type of allergies include both sneezing and scratching of the ears. Cats react to four types of allergens: food, fleas, materials that touch their bodies--such as flea collars or bedding--or environmental factors such as pollen or dust mites. Diagnosis is made through blood tests, skin tests, dietary changes and elimination of environmental triggers. Treatment could involve allergy shots, fish oils, or natural remedies such as yucca. Your cat will need ongoing veterinary attention for any type of allergies. Polyps are noncancerous growths that develop inside the nasal cavity or at the base of the eustachian tube. These growths generate various symptoms, including sneezing, loud breathing, swelling of the outer ear and ear infections. Your vet may want to sedate your pet to get a better look at the lump. Surgical procedures are the standard treatment. FIV is a serious disorder that can touch off both respiratory and ear infections. This virus depletes its victims’ immune systems, leaving them vulnerable to infections and cancers. About two percent of cats are stricken with FIV. Chronic respiratory and ear infections can be a warning that a feline is ill with this virus. Occasional sniffling or itching is normal among cats, but if the sneezing becomes commonplace and your feline engages in intense scratching, contact your vet.